World 6- Castle is the castle level of World 6 in New Super Mario Bros.
To start, Mario should jump on the stone platforms as they pop out of the walls, avoiding the lava. The first Star Coin can be obtained by throwing a Shell at it. The second Star Coin is found halfway into the stage, on a moving stone platform. After dodging some fireballs, the player will reach the Checkpoint. Mario should Wall Jump to the top set of platform. Then, the player should see a Koopa Troopa and two stone walls to the right. If Mario runs and jumps off the Koopa Troopa, and goes right at the moment the wall is at its lowest point, Mario should be able to go over the wall. Mario should go right to reach the last Star Coin. Alternatively the player could use the Mini Mushroom and jump to it. After going through a door, the player should time their jumps correctly, in order to reach the double doors. Past the door is World 6's boss, Monty Tank. The battle takes place outside the castle. To defeat him, Mario must jump on his head three times whenever he comes out of the tank, or throw Bob-ombs at him. Each time he is hit, however, another cannon will appear on the tank. 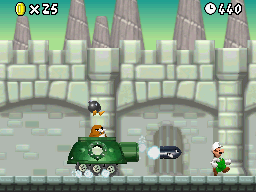 After beating Monty Tank, Mario is able to go to the final World, World 8. Star Coin 1: After crossing a few stone platforms, Mario will see this coin just above the lava. It cannot be obtained directly, so the player must toss a Koopa Troopa shell at it to obtain it. Star Coin 2: Just before midpoint, this coin is on a low stone platform. Mario must time his jumps carefully to grab it without falling into the lava. Star Coin 3: Shortly after midpoint, Mario can bounce off a Koopa Troopa to get on top of a pair of stone walls that move vertically, and then walk above the ceiling, off-screen, to find the third Star Coin in an alcove. This page was last edited on April 6, 2019, at 01:46.